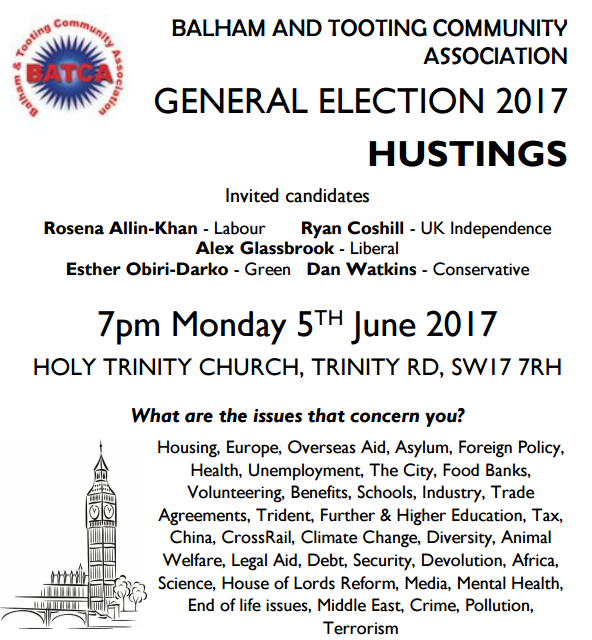 BATCA’s hustings on 5th June for the Tooting constituency was a real contribution to democracy in action. The event gave the public the opportunity to see the candidates in action and put questions to them. Each candidate spoke for three minutes on their response to the challenges facing our community. All then answered a series of questions put by members of the audience. These covered disability benefits, climate change, the case for military strikes in Syria, affordable housing, community policing and school funding among others. About 250 people attended the hustings, which was held in Holy Trinity Church, Trinity Road, Tooting Bec. This was the biggest attendance at any hustings of the 2017 Tooting election campaign. There was much public interest in the event, shown by the numbers attending, the number of questions put forward either in advance on line or on the night, and the attentive, lively audience.